I talked about my reading challenge for this year (here). So far, I’ve read a lot of books this year that I’ve been meaning to read for a long time. A very long time. Life . . . raising five kids . . . working . . . volunteering . . . managing a household . . . all seemed to get in the way. I’ve always been a reader, and I am blessed to have kids who love to read, too. I’m one of those people who has trouble putting a book down once I start to read it. I’m not normally a late night person, but if I am reading a book I turn into one. When I was a young girl, I used to take a flashlight to bed with me so I could read late into the night presumably without my parents knowing what I was doing. My reading list includes a lot of books that have been recommended to me by friends and relatives who read a lot and who share my love of reading. I even joined, Goodreads, a social network for those who love to read where you can track the books you’ve read as well as list those you want to read. The site includes book reviews that may help you decide whether or not a book will interest you or not as well as a Recommendations list based on how you have rated the books that you have read. 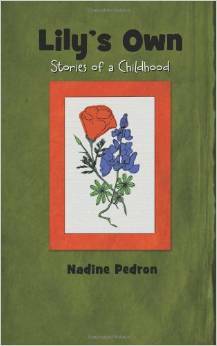 I just finished one book, suggested by my cousin, that is “a merging of autobiographical and fiction elements.” Lily’s Own, Stories of a Childhood by Nadine Pedron. It spoke to me on so many different levels that I felt compelled to write about it. Lily feels that she is different from the rest of her family. She has trouble fitting in at home and at school. At home, she talks a lot and asks a lot of questions. She is considered ornery and her father beats her with a switch. A lot. Lily talks about the switching almost matter of factly but does not ever say or lead you to believe that it makes her a better person. It does not change her “stubborn streak” or her ideas or her feelings. I was the oldest child of eight born in slightly less than nine years. My parents, particularly my father, believed in corporal punishment.My father beat us with a belt – sometimes making us pull down our pants so he could strike our bare bottoms. This form of punishment never did anything to make me change my behavior or ideas – it simply made me resentful and risk averse. Lily’s family moves from Texas to California during the Great Depression and the “Bowl of Dust.” When she starts to attend school in California, she is different because of how she talks and dresses and because she is poor. She has few clothes and those she has are either hand-me-downs or hand-made from flour sacks or re-made from other discards. Her shoes aren’t the original Bucks worn by her peers, but cheaper knock-offs. They are so poor that her parents cannot even afford to buy paper lunch bags, and Lily re-uses paper bags that she customizes to try to mirror the store-bought lunch bags used by the other kids. My mother was frugal. She attributes this to my father being a cheap skate, but it was probably a combination of having so many children and his cheap nature. We wore hand-me-downs and had to take lunches to school and never had the latest styles or fashions. In fact, we shared underwear and socks. Even these items were washed and thrown into a communal pile to be used on a first-come, first-serve basis. As we got older, some of my siblings took to taking the best items and stashing them under their pillows and washing them on the sly so that they could have their own underwear that was not shared. Lily’s parents and, in particular her father, are bigoted. Lily is not allowed to have her “Meskin” friends over and has to tell her black friend that he has to leave her party. In Lily’s words, “I don’t believe what you believe. I don’t think the way you think. I can’t be what you are. I’ll never be one of you.” (page 172) They are also “Baptist, Hard Shell” and make fun of Holy Rollers and those from other denominations. My parents were also bigoted. My mother’s nickname at work was DMD for dirty mouth D. No one escaped her verbal wrath – our Jewish neighbors, blacks, feminists, Democrats, even her own children. Everyone was fair game. A conversation with her today lasts about 15 minutes before it devolves into some sort of rant against some group of people with whom she objects. I remember thinking, at a very early age, that these opinions just did not seem right or make sense. Lily, for all the faults attributed to her by her family, loves to read and learn. Her teachers see her potential and push her to excel. One teacher pushes her to be on the debate team and learn public speaking. Another teacher pushes her to consider college and helps her to achieve that goal by taking her on college visits and helping her get scholarships. Another teacher helps her with geometry so that her college dreams can come true. She has a knack for always coming in second – in a debate match and as salutatorian of her high school graduating class. I was the first in my family to get a college degree, and I did so right out of high school. I was told by my mother that I was just going to college because of pressure from my father. My father told me, when I married while in college (to escape my family), that I would never finish. But I not only received a degree in 4 years, I did so without any support, financial or otherwise, from my family. It was a belief in myself and from others that got me through. There have been people in my life, outside of my family, that I have looked to as role models. Many were teachers. Many others were happily married couples. Many were my peers. Most of them have no idea what significant impact they have had on my life. For the better. In closing, while Lily’s family had their shortcomings and challenges in life, the most important way that they were different from mine was that they truly loved and supported one another. They didn’t tear each other down or sabotage each other’s success. Sometimes they didn’t realize better ways to support Lily or see her potential because of their circumstances, but at the end of the day, they did the best that they could to raise their children, keep them safe, help them when they were hurt, and give them guidance. It’s a tribute to Lily (and to the author whose story this is really about) that she was able to see the world beyond her birth family to make a different one for herself and her husband, children, and grandchildren. I hope that my “Down the Road” vignette will be a positive summation of my life’s experiences. This book was published in 2013, but was not available through my local library district nor on e-books so I ended up buying a copy which I will now proudly store on my bookshelf and recommend to others. I’m so glad you enjoyed this book Theresa. Clearly, it resonated with you on many levels. I am so proud of my friend Nadine’s personal accomplishment in writing her first book! I view it first as a fellow writer with her and am so in awe of her mastery of a very difficult creative style, writing in the first person voice from the present tense set in the past. Nadine is a terrific woman whose back story you would just never guess were it not for Lily. This gives me incentive to keep writing, too! I have three “books” in process – two are total fiction and one is autobiographical in nature similar to Lily’s story. May never get published, but someday at least my children will be able to read what has been on my mind.